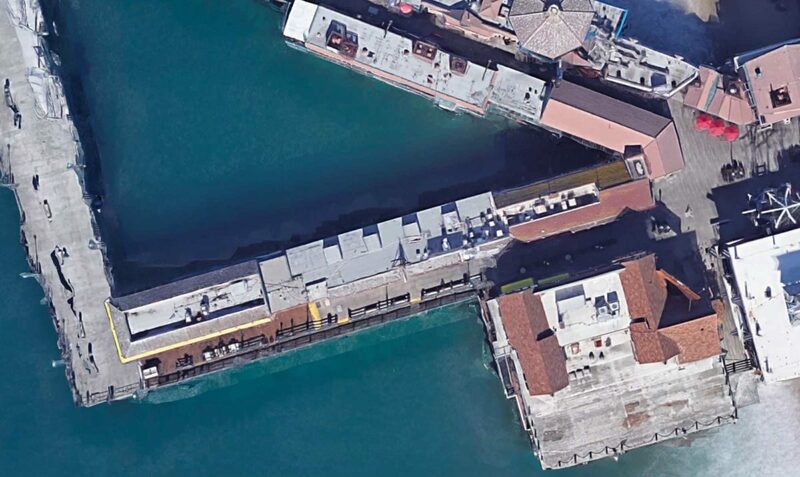 The Monstad Pier, the historical southernmost timber portion of the Redondo Municipal Pier, will soon change hands owing to the approval to a lease modification and blessing of the deal by Redondo Beach City Council on Tuesday evening. The Monstad Pier will become the second piece of Redondo Beach property in the portfolio of developer Leo Pustilnikov, who is also negotiating to purchase the AES Redondo power plant for redevelopment. Officially, what’s changing hands is the 66-year master lease to the land at 110-151 Fisherman’s Wharf, which has been controlled by the Trutanich family, owners of South Bay landmark Tony’s on the Pier. The length of the lease has not been adjusted, and will end in 2034. Terms of the deal between Trutanich’s Redondo Fisherman’s Wharf Company and Pustilnikov’s Next Century Power have not been disclosed. During a March interview, Pustilnikov indicated that he had no immediate designs for the properties, save for an art show planned for October. Tony Trutanich, with Donald T. Ballard, acquired its master lease from the City of Redondo Beach in April 1968. The names on the lease changed over the years, as partners joined and left, until Redondo Fisherman’s Wharf Co. became the sole lessor in 1971. The original minimum rent on the lease was set at $350 a month, plus a percentage of total gross sales. As of the Tenth, Lease Amendment approved on Tuesday night, the minimum monthly rent paid to the city will be $10,000, adjusting upward every five years in accordance with the consumer price index, not including percentage rents for various businesses on the pier. In 2018, the city made $196,500 in rent from the leasehold, and expects that to increase in the future as vacant spaces are rented out, according to a staff report. Businesses on the pier, including the Redondo Coffee and Bait Shop, Mie Pearl and Pacific Fish, are currently on month-to-month leases. The leasehold has long been on the market, and for more than a year has been marketed by BC Urban, LLC. Pustilnikov is reticent to discuss the future for the property, though he previously told Easy Reader that he was interested in renovating the area. According to the Redondo Beach City Council’s Closed Session agenda, Pustilnikov appears to be positioning himself as the person to make decisions for the waterfront’s future. He is listed in negotiations for the former Gold’s Gym property, as well as various leaseholds that were eyed by the city’s rebuffed waterfront development partner, CenterCal Properties. That could play well with Redondo Beach Mayor Bill Brand, who has long hoped for a comprehensive plan for the pier and waterfront, including a park at the AES site. Pustilnikov is aiming to provide 25 acres of parkland alongside wetland restoration.